The Round Rock Solid came in a hanging cardboard holder (it was stocked in the store hanging from a hook with minimal packaging). It was fully assembled and ready to go right out of the package. It cannot be taken apart. The Round Rock Solid consists of a regular stuff sack type bag combined with 4 straps (3/4� or 1.9 cm wide) and single pass buckles. The buckles can be tightened and loosened with one hand, if need be. The opening of the stuff sack is closed via a nylon drawstring and held closed with a spring loaded button tightener. The drawstring hole is reinforced with a rubber square, stitched to the bag for extra strength. The compression part of the bag has its own �lid� that goes over the drawstring opening and holds the forces of the compression straps. This allows the compressing forces to pull while not breaking the drawstring opening, since they are different, unlinked parts. 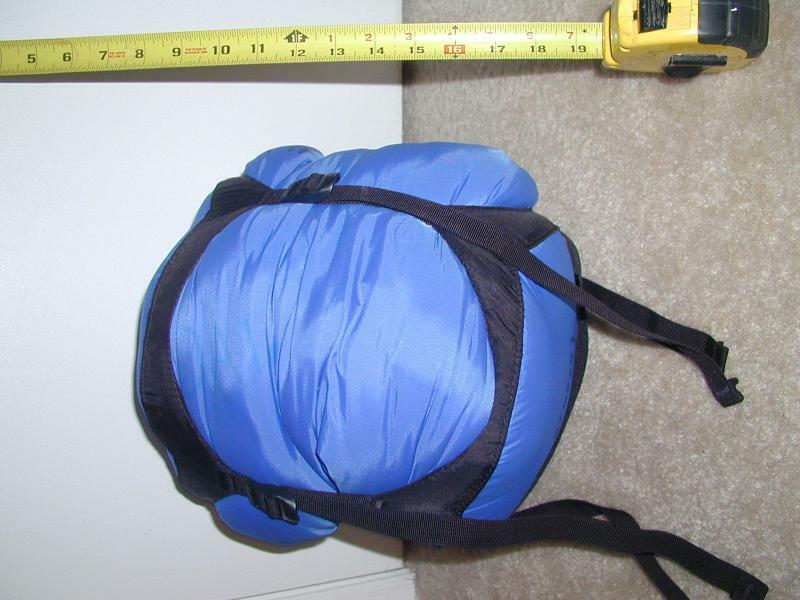 The bottom of the bag also contains a 3/4� (1.9 cm) wide grab strap. The bag is made of nylon and is not waterproof. Once all contents are placed in the bag, I pull the drawstrings closed. A small opening remains to tuck the string back into the bag. Then, the compression �lid� is placed over the opening to prepare for compression. Compressing the bag is done by pulling on opposing straps (I do 2 at a time) until the bag has reached its maximum compressed state. Sitting on it while doing this seems to help relieve stress on the straps and has made it easy for me to do with one hand (if need be). I have used this compression system on every outdoor or travel trip involving my sleeping bag since the day I bought it in 2005. I often carry, in addition to my sleeping bag and liner, a blanket, a towel, and a pillow. The most recent trip was a multi-day climbing trip. Once the contents are fully compressed, I usually stuff it down in the bottom of my bag's main compartment (since I won't be getting it out until the night). Then, at camp, it's easy for me to pull it out and toss it into my tent until I am ready to use it. Sometimes the buckles will catch on the sides of my pack's frame or something and it will loosen as I pull it out. If I orient it correctly though (buckles facing down), this doesn't happen. The straps don't loosen up unless the buckles are pulled away from the strap, even with lots of force on the straps. I am usually pretty cautious with gear, but I have found that I can tighten these straps to the highest force of my ability and they won't break. Initially, I assumed that the stuff sack was not waterproof, since it didn't have the appearance of a dry bag. Upon further investigation, I discovered an interior lining. This lining keeps water from flowing through the walls and ends of the stuff sack (it will actually hold water like a water bag). However, wherever there is any stitching, water can penetrate (during my water bag test, the water slowly dripped from all seams). I usually remedy this situation by lining it with a garbage bag. Things get a little bit tricky trying to compress it while not making the garbage bag airtight until it has been fully compressed. This is because the drawstring opening is held closed by the end cap as it tightens from the compression straps. I have found tightening the sack will force air out of the garbage bag, which can't escape if the cap is pulling on the opening of the sack too much (because of compressing the top closed). So, this was a little tricky. However, once I figured out the technique for doing this, it has kept my sleeping bag dry even in rainy weather. My compression sack has not showed any signs of ware from my years of usage. All the seam stitching is still intact, without any fraying. A couple of times I have cleaned it by tossing it in the washer machine with my regular clothes and hang drying (I don't recall any cleaning directions on the sack). This did not damage it. Also, I have been able to wipe it clean with a little water when small areas become dirty. 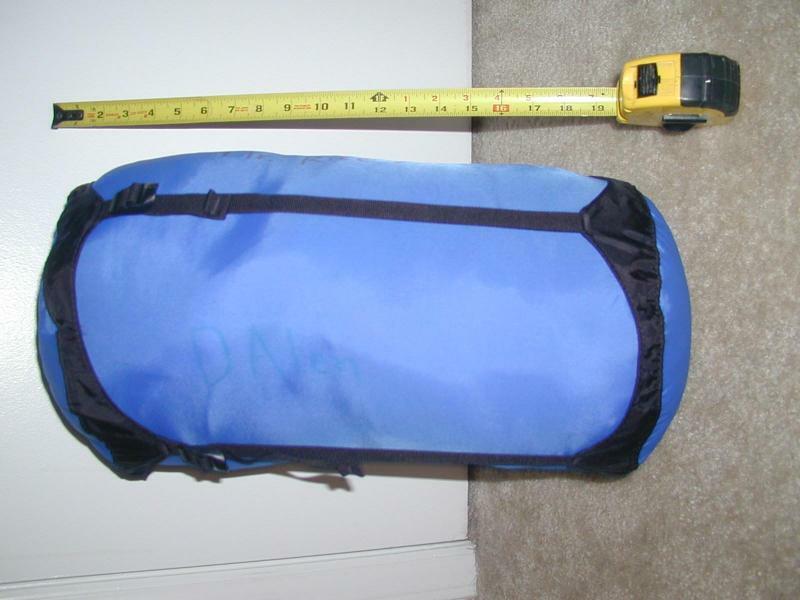 For the purpose of taking bulky items and making them smaller, the Granite Gear Rock Solid Compression Bag succeeds.